Sydney, Australia -- Dharma The Cat is a philosophical and humorous, yet poignant collection of cartoons that address the basic philosophical questions of life and existence. The main idea behind Dharma The Cat is not in the comic itself, but the commentaries which accompany each cartoon. 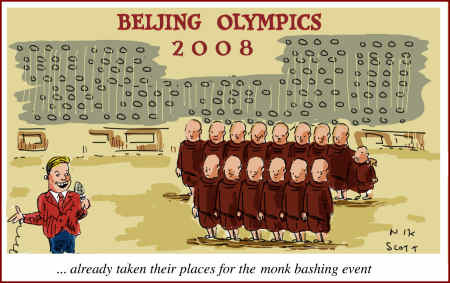 This week's cartoon and topic for discussion features the artwork of Australian cartoonist Nik Scott, with the openning commentary provided by David Lourie, author of Dharma The Cat, who has added his own voice to the growing chorus of dismay over the subject of political agendas within the Sangha. First Myanmar, now Beijing - when Buddhist monks participate in violent political protests, that is a very controversial event. 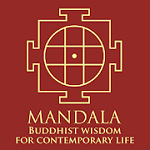 This is especially true for Buddhist practitioners, and even more so for Buddhist monks, who have taken strict vows to honour and practice the dharma (the Buddha's teachings), and to obey official the rules of conduct laid down for all ordained monks, for them to remain members of the order. At the core of the Buddha's teachings is the notion that in order to realise spiritual enlightenment, one must forsake all worldly attachments, including any attachment to personal and political issues. In doing this, one has to let go of one's concern for all problems arising from this ever-changing and often cruel life we're born into, which is generally imbued with unsatisfactoriness ("dukkha"). Many people outside Buddhist circles have long queried, "Why don't Buddhist monks take a more pro-active role in championing human rights?" The answer is that the official precepts for Buddhist monks, strictly interpreted, don't allow this sort of conduct. A fundamental principle of Buddhist conduct is to "not be attached to any outcome" of one's worldly activities, regardless of what's at stake. The Buddhist principle of Right Conduct requires monks to never violate the highly valued spiritual states of equanimity and non-violence. 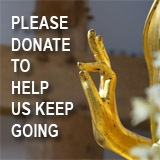 So in difficult times like these, the equanimity and tolerance of any Buddhist monk is severely tested. Therefore, what would the protesting monks' ideal solution be, for these conflicting objectives - to improve worldly conditions vs. realizing one's own spiritual enlightenment? My own view on this is that if the worldly issues are pulling on a monk so hard that he can't resist participating in worldly actions like violent protests, which go against the dharma for monks, then he should first remove his orange robe, and engage in those mundane activities as a non-Buddhist. But that's just my opinion, and I know that opinions differ greatly on this subject. Living on Sydney's idyllic northern peninsula, David Lourie is a multi-award winning editor of TV documentaries, including an Emmy Award for "War Child" produced by National Geographic in 1999. Since 1997, his comic strip "Dharma The Cat - Philosophy With Fur" has run in magazines in 28 countries and has been translated into 18 languages. Nik Scott's comic strips and illustrations have published in the Sydney Morning Herald, the Bulletin, The Canberra Times, The Green Left Weekly, The Jewish News, Rolling Stone, Prospect, National Lampoon, and the New York Times, as well as illustrations in more than 100 books for publishers, including Simon and Schuster, Allen and Unwin, and Macmillan Education.